These days between people with celiac disease, those affected by antibiotic overuse and those affected by GMO products, artificial sweeteners, high fructose corn syrup, and pesticides, a lot of patients have compromised gut function with digestive disorders including malabsorption. Last week I attended a mini-seminar by Metagenics about the research on their newest product UltraGI Replenish. 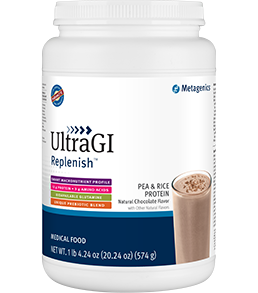 UltraGI Replenish represents an unprecedented level of product development and research at Metagenics to deliver a unique combination of ingredients for a truly forward-thinking approach to supporting the specific needs of patients challenged by compromised gut function with digestive disorders including malabsorption. • Non-GMO, gluten free, and soy free to complement a modified elimination diet and help reduce digestive discomfort. Of course this product is followed up with administration of Ultra Flora probiotics. Probiotics can vary significantly in potency, efficacy, and safety, which can result in inconsistent health benefits. Many products fall short due to various reasons, including not identifying the probiotic strain that is linked to specific health benefits. Additionally, some products have also been found to contain specific contaminants (gluten, mold, yeast, and potentially harmful bacteria), which can cause negative reactions and deleterious health effects in susceptible individuals. Through extensive and rigorous quality controltesting, UltraFlora guarantees the highest quality of purity (free of contaminants), potency, and scientifically formulated probiotic formulas that contain genetically identified strains with established health benefits for clinically reliable outcomes . For more information on Metagenics, please read Nutritional Supplements: Why Metagenics ? Today in the NYTimes: http://www.nytimes.com/2011/04/03/weekinreview/03harris.html?_r=2 which talks about taste tests done on foods that don’t contains artificial colors/dyes. And I have to think how wrong it is to eat a so called food that will be vibrant for years. After all we know that as soon as you pick a fruit, for example, that it starts to lose nutrients. 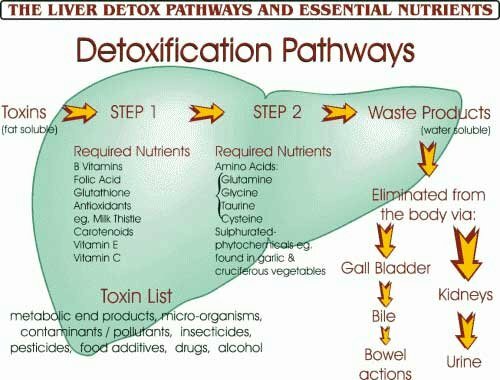 So what nutrients might be left after years?? Ok, you say but I want some potato chips! Ok how about doing what Michael Pollan suggests; make them yourself. I’d make mine w/ new potatoes and olive oil. The coloring would be natural, some nutrients from the potato and olive oil and no fading because I’d eat it all up.